Turning Unexplored Possibilities Into Fulfilling Realities | Choose Your Energy: Change Your Life! 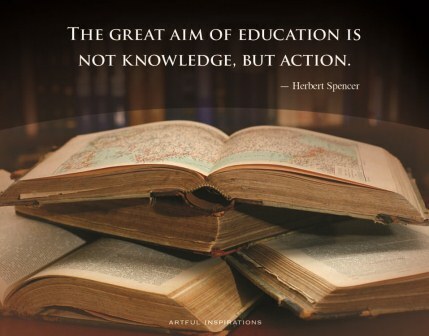 Many pursue an education to gain knowledge. But knowledge alone isn’t all that useful. It’s when we apply what we have learned that it becomes most valuable. Think about all the things you know, but haven’t put into action. The great aim of education is not to amass vast quantities of information; it’s to take what we know and use it to shape our lives and impact the lives of others for the highest good of all. But, when you find that even the Nike slogan of “Just do it!” doesn’t spur you into action, then what? What is it, exactly, that keeps us from acting on our greatest passions and most deeply held beliefs? In short, fueling yourself with fear rather than love. While my own tendency toward perfectionism was delaying the release of this post by telling me I needed to write elaborate refutations of each of these barriers to convince you of their falsehood, I recognized yet another fear-fueled lie and decided, in the spirit of Nike, to speak my truth clearly and succinctly—HOGWASH! While fear might temporarily trick us into mistaking its twisted perspective for reality, none of these barriers are based in TRUTH. Come as you are—Show up and bring the best I have to offer in this moment. Not last year’s best, or next year’s best or someone else’s best. Just the best I’ve got to offer with the love and light I’m giving myself access to at this time. Quit judging myself as insufficient. I am always enough, just as I am right here and now. Live the Truth—God is God, I am God’s and love is the greatest power in the Universe. My Source is excellent, limitless, and reliable. No external force can block my highest good. Universal abundance flows to and through me. Whatever my circumstances, I know who I am and Whose I am. I am a unique cocreative expression of the Divine. How could that ever not be enough? Commit to the highest good—Universal love is always unfolding the highest good for all, in all, through all. Love, respect, curiosity, and compassion reveal and advance the highest good. My part is to align myself with the highest good by keeping myself free of fear and holding myself wide open as a clear channel for love and light. Way cool! Express gratitude—While feeling grateful is a nice start, don’t stop there. Express it to and for every being, encounter, and experience. Appreciate my life. Know that everything’s an opportunity. Expect it. Go looking for it. Notice it. Say, “Thank you!” Gratitude for Universal abundance fosters generous, effortless, gracious flow filled with faith, hope, prosperity, peace, and joy. And it starts with being grateful for every aspect of myself—the attributes that thrill me and those that frustrate me and everyone who knows me. They are all essential elements of my unique cocreative role in expressing the Divine. I totally rock! Trust God with the details—Resist the urge to over-manage the minutiae and end up trapped in the weeds. Even though I’m bright and creative, that level of specificity is way above my pay grade. Remain focused on my responsibilities (the first four parts of the mindset) and stay tuned to the Universal frequency for further instructions on where to go, what to do, when, and with whom. When I discern, focus, and follow through, the Universe works wonders through me. My job becomes so much easier when I allow God to be God! The next time you learn something new or get a good idea, demonstrate its full value by applying it to your own life for the benefit of all. What one idea are you itching to put into action with the first itty, bitty baby step, right here and now? Live your truth: just do it! For more on how to transcend your fears and step into your greatness by learning to love yourself unconditionally, read Choose Your Energy: Change Your Life! (Hay House/Balboa Press 2013). You’ve got nothing to lose, except the limits fear, stress and pain have been placing on your life. This entry was posted in All My Blog Posts, Authenticity & Purpose, Creativity & Self-Expression, Force, Flow & Baby Steps, Love, Fear & Gremlins, Stress, Perfectionism & Burnout, The Power of Sharing Your Story and tagged Deborah Jane Wells, From fear to love, How to de-stress, How to stress less, How to write a book, How to write your story, Love or fear, What are baby steps, What is authenticity, What is burnout, What is creativity, What is fear, What is life purpose, What is my life purpose, What is perfectionism, What is stress, What is stress management, What is the meaning of life, What is the purpose of life. Bookmark the permalink.